I can't keep the smallmouths off this chartreuse Half and Half—want to try one? I'm doing fine with a Woolly Bugger thanks. Ever fished a hair-bug? It's a kick back in the shallows—they're just slamming it! Oh, I'll just stick with the Woolly Bugger. 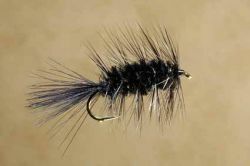 This Marabou Leech is hot! I've got plenty if you'd like a couple. Woolly Bugger's working okay. No thanks. Sure it's working okay, but maybe something else would work better than "okay." I've had lots of conversations like the ones above. It surprises me just how many good fly fishers won't leave the comfort of this reliable all-purpose fly. They'll pull it out regardless of species—all the trouts, largemouth bass, smallmouth bass, even Pacific salmon and tropical saltwater fishes. Sometimes I wonder, do they think the Woolly Bugger is the only fly in the world? But we all know it's not. And I can't imagine how anyone could collect his or her gear and pick up the basics of casting and fishing without knowing that there are lots of fly patterns out there, tens of thousands—if not hundreds of thousands, of them. All those patterns exist for a reason, honest! But I'm not demeaning the Woolly Bugger. I've seen it catch plenty of fish, and have caught quite a few myself on it. It really is a versatile and effective pattern and has earned its popularity on the square. I'll never tell you to abandon it. I'll only suggest that at times, in some situations, other nymph and streamer patterns may be more effective. No one fly is always the best choice—twenty years of research for writing fly-tying articles and books and forty years of tossing flies at moody fish have utterly convinced me of this. Yet fly fishers sometimes become so dependent upon a fly pattern that they're almost fearful of tying on anything else; even a really good fly can't live up to such expectations. These anglers need to open their minds and give some other patterns an honest try. So, here are some conditions when other fly patterns may be better than the Bugger, and some specific patterns from which to choose. I'm a great fan of dragonfly nymphs. These hulking insects, out hunting their own prey, expose themselves regularly to trout in lakes (and to bass, too). Being the largest insects in most lakes, they get noticed, and eaten. I believe trout keep an eye out for dragon nymphs all season long. In his book Strategies for Stillwater, my friend Dave Hughes recommends an Olive Woolly Bugger with its tail pinched off short as an imitation; he calls it a Pinched Woolly Bugger. Certainly this is a reasonable approach—the short tail brings the pattern closer to the dragon nymph's stout form. There are, however, other options. For the past several years I've relied mainly on my own Furry Dragon for imitating dragonfly nymphs. Its abdomen of soft fur swells and slims like the abdomen of the real nymph. Fished slowly along a lake's bed—though sometimes in the rapid darts of the nymph when it's alarmed—behind a type-I (slow-sinking) or type-II (medium-slow-sinking) line, the Furry Dragon has become my standard solution for those frequent times when lakes offer no hatching insects to match. But I used to rely on the Taylor Dragon, a logical and simple imitation. Of all the creatures Woolly Buggers are asked to impersonate, the leech of trout lakes is the most reasonable. The Bugger's lively marabou tail and stout body do suggest both the leech's winding swim and shifting form. But there are flies designed for this duty alone that I have come to trust for imitating a leech. One is Hal Janssen's Marabou Leech, though I've come to tie it a bit differently than the original. Another is my wife Carol's Punk Leech, which is really just a variation of Hals' fly. Over the past few years I've come to like the Clouser for largemouth bass, too, a Clouser with plenty of Krystal Flash and Flashabou in the wing. If you want a big shaggy, shapeless mouthful to throw in among the lily pads for largemouths, try a Bunny Leech some time. Even a little jiggle sends waves down its supple hide and fur; it pulses and swells and just looks meaty and alive. Bass love it. I haven't fished a "Zonker", a fish-like pattern with a belly of woven molar tubing and a lively wing of rabbit fur on the hide, much for smallmouths, but I've caught lots of largemouth bass on it. I like to tie it with dark-olive rabbit and gold mylar—the impression of a baby bass. It's great in the shallows or allowed to sink alongside docks or any deep cover, then teased back slowly. A white-backed Zonker in the shallows of a clear lake is a kick. You see the pale blur over the dark lake bed, spreading then darting, spreading— then it's gone. Strike immediately—the fly is hidden within the camouflaged head of a largemouth bass. And if the fly is large and none of its white wing shows...likely a big largemouth bass. Spring creeks, tailwaters, lakes, ponds, saltwater bays and reefs, salmon, brown trout—sometimes the Woolly Bugger just works, even where and when it probably shouldn't. But if it doesn't work, yet you sense that something similar might, try another streamer-type attractor fly. Try a Half and Half. It's a sort of half streamer (with feather wings) and half bucktail (with a hair wing), and also about half each of two different popular flies: the Clouser Minnow and Lefty's Deceiver. It's a fly for all sorts of fishes: all the trout and char species, Pacific salmon, largemouth bass and smallmouth...and while it can be excellent in the natural colors of the small fish on which larger sport fish prey, it is often just as good, sometimes better, in truly unnatural colors like yellow and chartreuse (yellow or white saddle hackles and chartreuse buck tail is the favorite combination of Lefty Kreh and Bob Clouser, the fly's co-creators). The Articulated Leech has been a big hit, and sophisticated as it sounds, it's no big deal to tie. It's like a leech, but after checking around I found it's apparently used only occasionally to imitate one. Steelhead fly fishers now consider it a standard. Stream anglers use it often for big trout. the Articulated Leech isn't particularly a leech imitation but really an attractor fly. It is also the fly we'll tie. I checked around and could find no originator for the pattern, and no standard design. Articulated Leeches are tied with marabou or with rabbit fur, with metal beads or cones or barbell eyes or just thread heads. But the heart of this fly is its joint, the hinge by which its two halves are connected, and even it varies—I found patterns with a loop of monofilament through the rear hook's eye and others with a loop of braided Dacron, in other words, fly-line backing. It was all rather confusing, so I called a friend who deals with fly designs even more than I do, and more directly with fly-designers and fly shops and guides: Ray Chang, of the Solitude Fly Company. Ray told me that he knew of no originator or definitive pattern for the Articulated Leech either, but had assembled Solitude's version from imagination and some sniffing around his various sources. Ray prefers the rabbit-strip approach, the braided-backing hinge, and barbell eyes to get the fly quickly down to holding fish. He also likes to run the ends of the backing down through the hook's eye (which requires a hook with a big eye) and double them back along the underside of the shank, to really anchor the backing to the shank, as we will in the instructions to come (see the instructions in The Only Fly in the World, Part Three). In The Only Fly in the World, part two, Skip lists his top flies to bust through the "one-fly-works-okay" mindset. In part three, he ties one of those top flies, the Articulated Leech.